All secret bunkers and special cities in Russia are run by the FSB and the Main Directorate of Special Programs of the Russian president, and very little information is available about them. 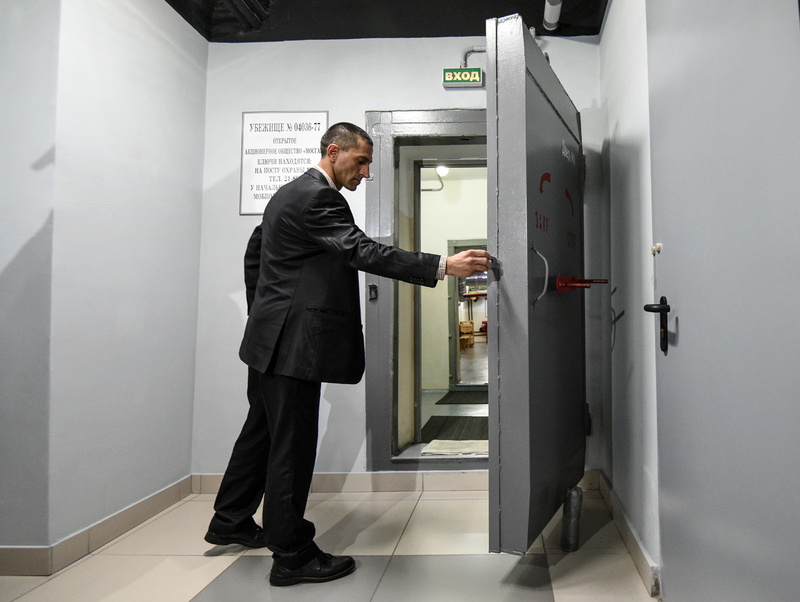 Photo: An employee shows the entrance to protective shelter in Moscow. U.S. intelligence is studying Russia's capabilities for a retaliatory strike in the event of a nuclear war. Special attention is paid to bunkers that the Russian military plans to use to hide the country's top leadership if the need arises. In the 1980s the U.S. recognized the Soviet Union as the most formidable country in terms of withstanding nuclear strikes. Today, the U.S. leadership is once again evaluating the level of Russia's security against a potential enemy’s nuclear weapons. The strategic information that U.S. Strategic Command (USSTRATCOM) and the U.S. intelligence agencies will soon begin to compile by order of Congress includes "the location and description of underground communications that are of political and military importance," reported (in Russian) RIA Novosti. The Russian media has found out which Russian nuclear defense secrets are already known to the U.S. and how, in the event of a nuclear strike, the Russian military would allow the country's political leadership the opportunity to launch a retaliatory strike. "For a long time USSTRATCOM and the U.S. intelligence agencies have known about the Russian system of highly-secure command posts for the top leadership, the multiple reserve channels for military command and communication, as well as about the high level of durability of land forces and a part of the naval forces," said Major General Vladimir Dvorkin, a former director of the Defense Ministry's 4th Central Scientific-Research Institute, in an interview (in Russian) with Gazeta.ru. The American military also knows about the existence of another Russian defense system that would be used in the event of a nuclear strike from the U.S.
"When the USSR was faced with the American threat, we created the Perimetr System (known in the West as the 'dead hand')," said Colonel General Leonid Ivashov, president of the Academy of Geopolitical Problems, in an interview (in Russian) with Vzglyad newspaper. "The system is a duplicated command point that would immediately give the order to launch missiles even if the country's top leaders die." All secret bunkers and special cities in Russia are run by the FSB and the Main Directorate of Special Programs of the Russian president, and very little information is available about them. Occasionally, information seeps into the media about the system of secret bunkers and cities, mainly from declassified KGB archives. Vzglyad reports (in Russian) that an underground city that can house 15,000 people is located in Moscow's Ramenki district between Moscow State University and Udaltsov Street. Also, an underground residence for the president and military command is located 60 kilometers from Magnitogorsk, in the Yamantau Mountain, near the Abzakovo mountain resort." "Mezhgorie is a closed city near the south Ural mountain of Yamantau and it was built during the Cold War," wrote (in Russian) Gazeta.ru. "It’s often mentioned in the media as "Putin's bunker." In the 1980s the USSR already had bunkers for the country's top leadership, and post-Soviet Russia continued its nuclear defense systems during President Boris Yeltsin. Under Putin "life maintenance systems were modernized and can now function for three months," General Ivashov told (in Russian) Vzglyad. Today the Russian leaderships' safety is fully guaranteed, and it is much more than just a bunker system. "There is anti-missile space defense and a missile attack warning system," said Lieutenant General Andrei Bizhev, former deputy commander-in-chief of the Russian Aerospace Forces, in an interview (in Russian) with Vzglyad. "Not one movement of strategic nuclear forces from an opposing side, not a single test launch goes unobserved by Russian Aerospace Forces. There is triple security. We have a global missile attack warning system and this is duplicated by an orbital group in space."